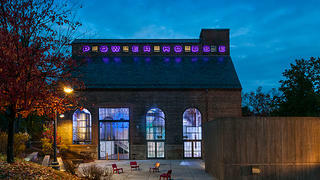 The renovated and restored Powerhouse reopened in December 2014. It’s a question that all historic college campuses must confront sooner or later: what happens when a building with a legacy is still structurally sound, but functionally obsolete? For a 1925 brick steam plant at Amherst College in Massachusetts, that question escalated for decades. The 6,500-square-foot structure, designed by the respected Gilded Age firm of McKim, Mead & White, was taken out of commission in the 1960s, when a new gas and oil-fired plant was constructed to provide heat to the campus. The original steam plant had been serving as an underutilized garage and storage facility for the buildings and grounds crew ever since. 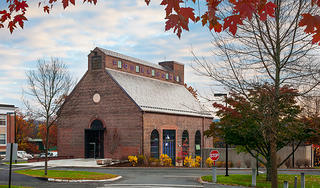 Enter Cambridge's Bruner/Cott Architects. 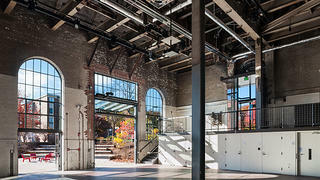 Amherst’s Chief of Campus Operations, Jim Brassord, admired the firm’s award-winning conversion of a former factory building complex into a new facility for the Massachusetts Museum of Contemporary Art, and in 2012 the college approached the firm about a possible reconceptualization of the steam plant as a place for students to organize their own events and programming. 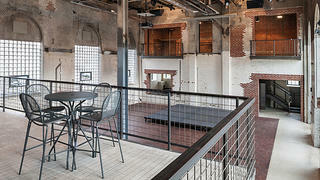 Bruner/Cott saw powerful potential in the high-ceilinged red brick building, and the Powerhouse concept was born. “It was a small but complicated project,” says Simeon Bruner, principal at Bruner/Cott, explaining that the process took about a year and a half before being completed in late 2014. 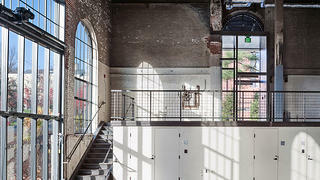 The key to the $3 million project’s success, he says, was finding the duality between the building’s historic and modern uses. The existing infrastructure in the former steam plant, Bruner says, was lacking. “Nothing in [the building] was relevant to what we were doing,” he explains. “It was an unheated building, except for the thousands of BTUs that escaped from the heating plant. There was no wiring. It was basically an industrial building that was self-contained." Thanks to an infrared ceiling heating system and insulating glass windows, there was no need to insulate the building’s brick walls. In the summer, cooling the space down is as easy as opening the windows and the retractable glass garage door that Bruner/Cott installed to blur the lines between the building's exterior and interior. A new concrete patio serves as a gathering place for students in the warmer summer months, as well as an overflow area for crowded events at the Powerhouse. Like this story? Then you'll love our emails. Sign up today. The building's exterior boasts a new color-changing, LED-lit sign. Bruner/Cott installed new doors topped by windows that were similar in shape to the originals. The addition of a glass retractable door allows the space to open up to the outdoors. The original steam plant, as pictured in 1933. A new balcony allows for a multi-level experience. Re-configuring the space called for some large-scale structural changes as well. The firm, working with a team of contractors, was able to eliminate five of six original columns supporting the ceiling. The structure’s attic had formerly housed a coal bin holding roughly 650 tons of coal, but since the top story no longer had to bear that load, the architects were able to convert the columns into trusses and open the first floor up into a space that would allow occupants to move freely. 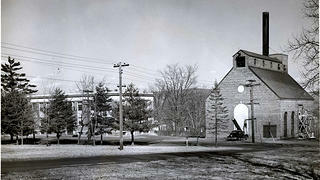 The new/old building has been a colossal success on the Amherst College campus. Thanks to the addition of state-of-the-art lighting and sound systems, students are able to use the space for performances and concerts, parties and dances, yoga classes and food truck nights. It’s a unique union of old and new, one that will continue to serve the campus for decades, if not centuries, to come. "Do you go backwards or do you go forwards?" Bruner says of the challenges of knitting past and present into one structure. "On this one, I think we tried to do both. Hopefully, when you look at the building, you still recognize it. When you're inside it, it's no longer contained, but open." "You have to make sure that the hand of the original architect shows through. You’re working with it, as opposed to against it."